Bill, Frances, Louis and Zoey have received a full retro-NES makeover, and we like it. 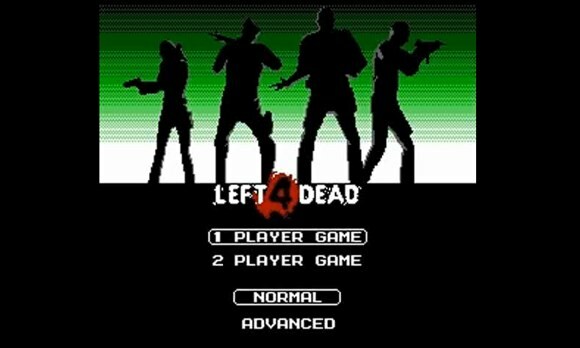 Eric Ruth and PixelForce NES are responsible for this amazing "de-make" of Left 4 Dead. So far there is a full trailer out for the game, but by January 2010 Eric Ruth expects to have a full release of the pixelized Left 4 Dead on PC. If Left 4 Dead had been around in the 80's, this is what it would look like. "It features all the campaigns from the original game, including 8-bit incarnations of the special infected, for two players to play through -- it is a NES game after all, fancy four-player wasn't standard." As you'll notice, there is the option for "2-player," which completes this so-called "de-make" of the game since Left 4 Dead is a prime co-op gaming example. Left 4 Dead To Have Demo, Release Date?